Klondike Gold Rush fever spread through the world in 1898, bringing tens of thousands of dreamers, mostly Americans, into the harsh and frigid reality of the Yukon. Dawson City was its epicenter, but to get there those Klondikers had to endure a months-long journey against Mother Nature that was brutal beyond imagination. During its peak year, almost 90,000 people lived in and around Dawson City, where before there had been a tiny outpost and First Nations dwellers. When the gold rush ended, gold mining by larger corporations continued until the early sixties. But what is little known by the outside world is that small claim gold mining has continually existed. It lives on in the spirit of a hardy bunch of dreamers even today. I had a rare chance to visit the normally secretive world of the small claim gold miner, to learn about how these men and women etch out a living from the Yukon’s very soil. It’s fascinating tale for those of you interested in the nexus of history, geology and mineralogy. Even today, anyone can stake a claim to mine gold in this incredibly beautiful country. The fees are modest and once registered the lone miner usually second mortgages his home or begs and borrows from friends and relatives to buy the equipment needed to extract these metals and minerals from the earth. Few miners today pan for gold, although some still do. 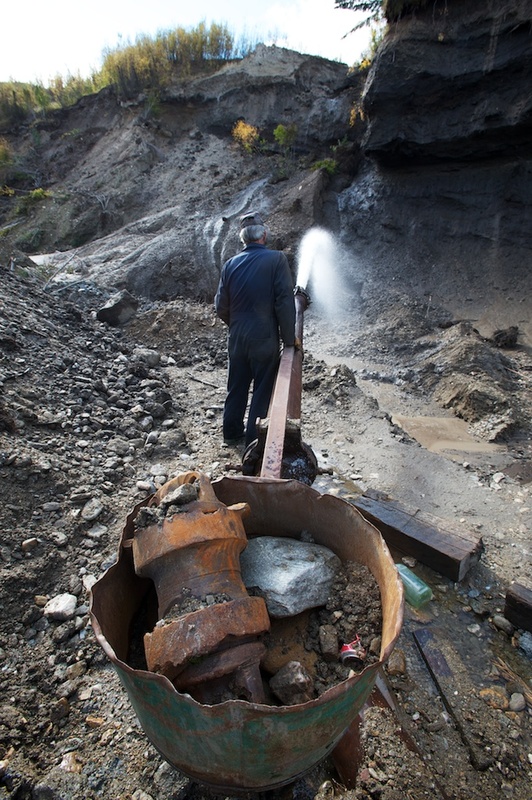 Most miners here do what is known as placer mining, derived from the Spanish, meaning “a place where gold can be extracted from gravel.” Placer mining involves using massive amounts of high pressure water to forcibly remove equally massive amounts of soil and gravel from a hillside in order to expose and recover the gold. I visited the claim of Ralph Troberg, who has been mining his patch of ground near Bonanza Creek for the past 40 years. Ralph mined full time until 1991, when the price of gold dipped so low it was not economical to mine anymore. For 15 years he depended on his training as a heating mechanic in his own business. With the rise of gold to new historic highs in recent years, Ralph is back to full time mining, a calling that he loves dearly. Mining nowadays is often a family operation. “My son would join me if he could,” Ralph told me. “But his job and family situation in Edmonton prevents him from leaving right now.” In the same way, many women were brought up in mining families and have their own claims. 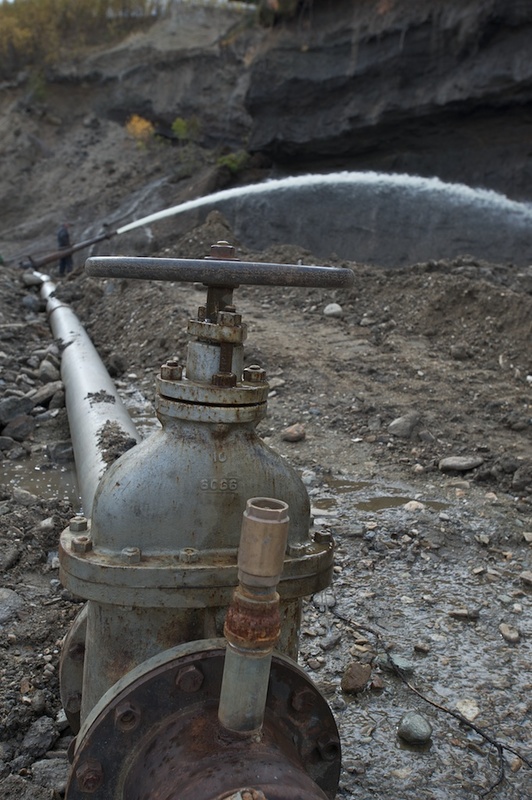 On a typical day, Ralph will draw water from the creek along a piping system with a series of check valves. 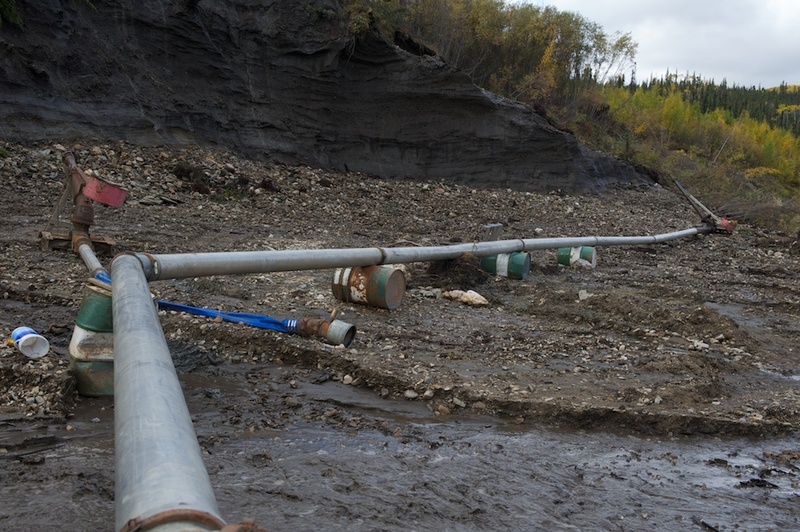 These pipes run water to what is known as a monitor, or a hose setup that blasts high speed water towards the exposed soil. Ralph will operate this monitor for 12-16 hours a day during the 100-day period that the Yukon does not experience winter. 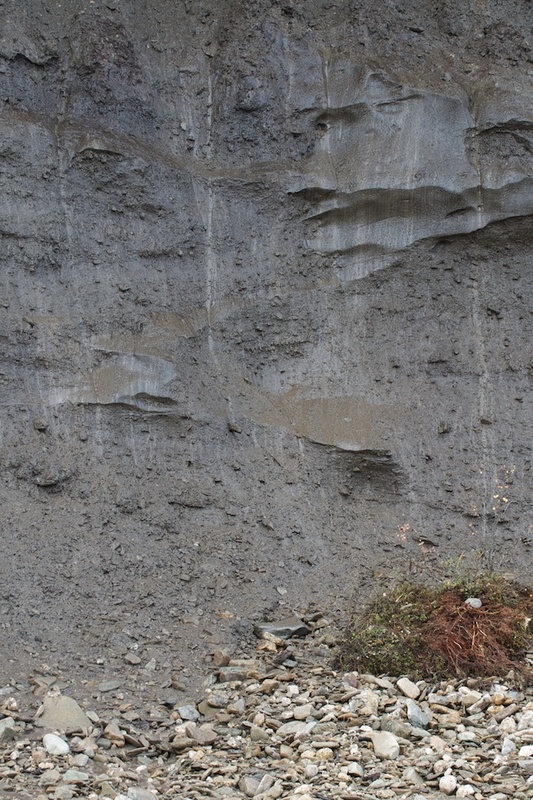 The high pressure water Slams against the cliff face, exposing the permafrost to the warmer air. 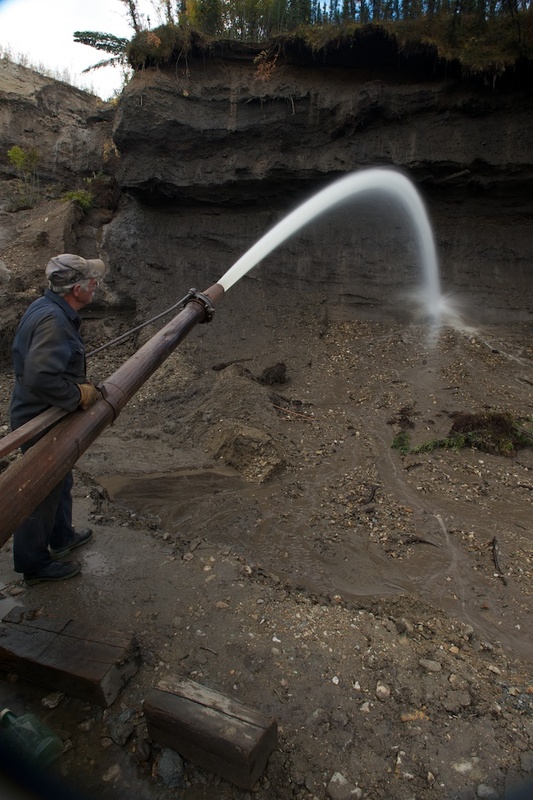 As the soil melts, Ralph will spray it over and over, blasting away the hillside inches a day. The shallow-rooted trees on the top of the hillside will eventually fall into the excavation site, to be bulldozed away later. The monitor is counterbalanced by a bucket of discarded mining equipment, proof that a miner can run his operation on chewing gum and rubber bands. Even though he seriously undercuts the hillside, the soil will not collapse in chunks because of its high clay content and frozen state. A gold mining operation it is a dangerous place to work. As soon as I entered his claim, Ralph warned us: “I don’t have no insurance, so if you get hurt I’ll have to bury you right here.” I think that was a joke. Throughout the mining camp old discards are used in practical ways, as you can see from the used barrels being used as supports. The monitor itself dates back to the period right after World War I. The muddy water runs downhill to a series of holding ponds that allow the silt to settle out before being returned to the watershed. Environmental studies conflict on whether and how much this deteriorates water quality, but there is little dispute about its effects on the land. 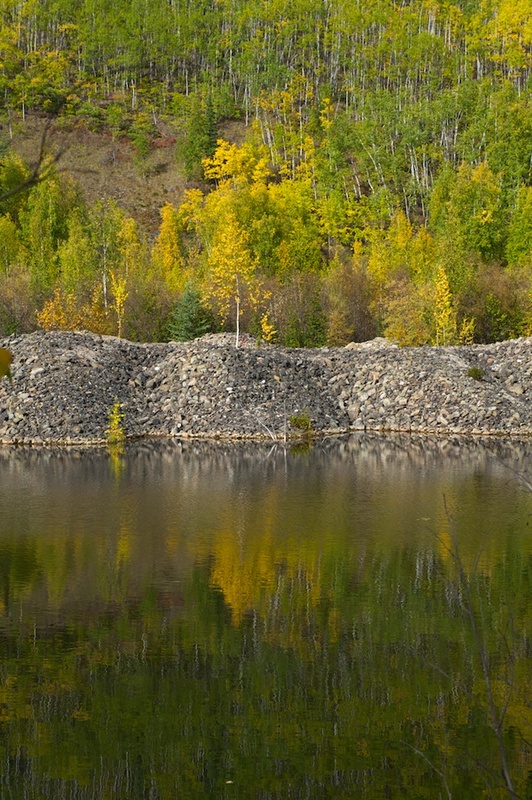 Since the late 1980s, miners have to implement a land reclamation process to ensure that the land is returned to prior use standards. This next image shows an unrestored mining area from the early 20th century that is nonetheless restoring itself. The piles of stone are called tailings, and they were left in giant heaps as immense dredges scoured the creeks for gold. These tailings snake through the landscape for miles. But the dredging was necessary to remove the top-layer of soil and gravel to get to the layer where gold particles could be found. Gold, being some 19 times denser than water, will sink as the water runs downhill and Ralph later dredges it up and brings it to a sluice, where he rinses it again to remove the gold from the silt. 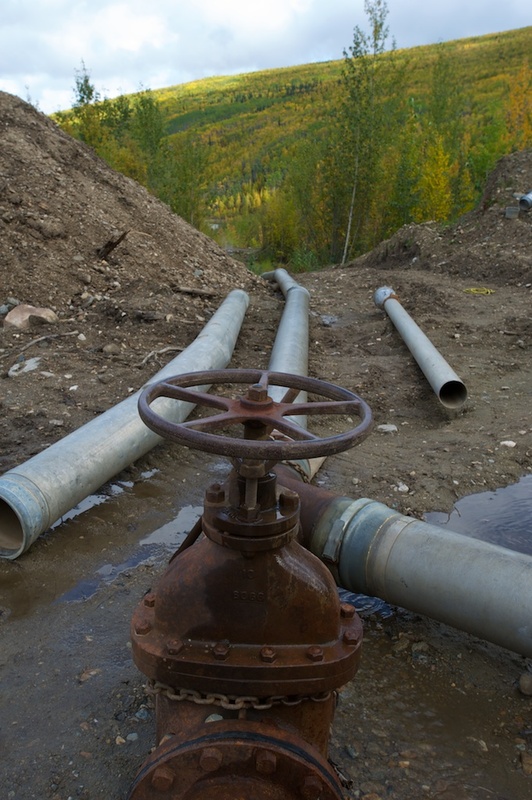 How profitable is Yukon gold mining today? No reputable miner will ever tell you. But Ralph, for example, is able to fly to Mexico for the winter and also managed to take a cruise through the Panama Canal last year, something he has wanted to do for decades. So, if you’re willing to endure long hours, tedium, hard work and loneliness, come to the Yukon and stake a claim. There’s still gold in them thar hills.